Semarchy was excited to return to this event as a Platinum Sponsor, as MDM DG moved to the Midwest! 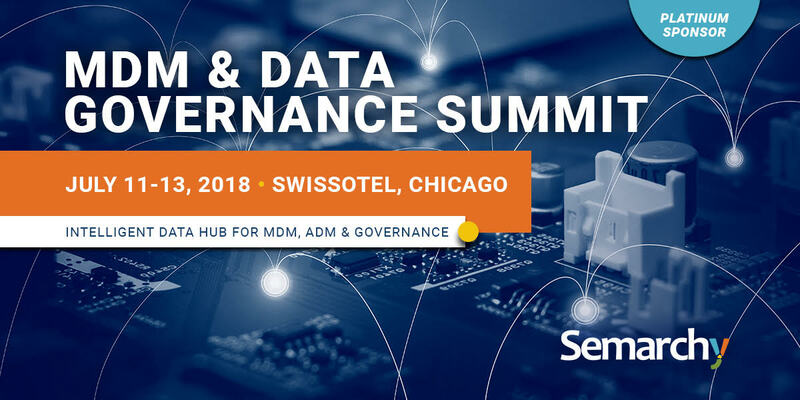 The event covered all levels of MDM and DG implementation and we focused on how as the Intelligent Data Hub™ company, our agile xDM platform leverages smart algorithms and material design to simplify all your data needs. The Data Lake is the to-be model for modern data management. But left unchecked, governance, quality and reference data can get out of control. AAIS employed the xDM Intelligent Data Hub from Semarchy to curate and pair information from the data lake with product information empowering business users to own and govern the mastering process. The American Association of Insurance Services (AAIS) serves the P&C insurance industry as the only national not-for-profit advisory organization wholly owned by its member companies. AAIS delivers tailored advisory solutions including top-shelf policy forms, rating information and data management capabilities. This modern data management platform has allowed AAIS to reduce affiliate implementation times by over 85%, due to flexible data hub structures leveraging APIs and customizable data integration formats. Overcoming obstacles with a cloud-based Hadoop-centric Data Lake in a highly regulated environment. How to refine the process of communicating data intelligence across the organization with a highly-configurable interface that supports demanding business users. AAIS leverages the Intelligent Data Hub atop its Data Lake to serve up product and associated reference data, leveraging an intricate data model covering millions of records. Joe Wilhelmy is the Director of Data Engineering for the American Association of Insurance Services (AAIS). With over a dozen years of experience in Engineering, Information Management and Analytics across a variety of industries, Joe leads AAIS’s strategic initiatives for modernizing and innovating insurance product development and data services. He has built and delivered a Data Lake, built upon the Hadoop framework, that delivers structure and density agnostic data integrations and models which are used to develop P & C insurance products, actuarial analyses and Regulatory reporting artifacts. Michael has been working with industry analysts, developers, service, sales and support professionals in the data & analytics industry since 1999. Over that time, he has led teams at organizations from IBM and MicroStrategy to Kognitio and Trifacta. As the Chief Marketing Officer (CMO) at Semarchy, the Intelligent Data Hub company, he spends time with clients, partners and industry experts to build their vision for smart, AI-enabled software, governance and data stewardship. An accomplished writer, speaker, and blogger, he enjoys reinventing how technology can help improve business outcomes. We were also pleased to host a private dinner reception with Conference Chair Aaron Zornes on Thursday Evening.